In a food processor pulse one cup of wet spent grain for 30 seconds or until finely chopped. 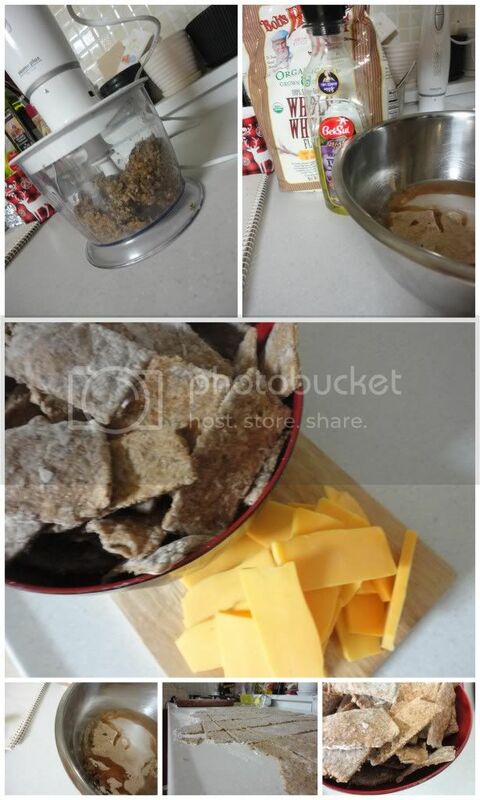 Mix together with 1 1/2 cups Whole Wheat Flour, 1/2 cup Water, 2 Tbsp Sugar or Honey, 2 Tbsp Vegetable Oil and 1/2 tsp. Salt. Turn out onto floured surface and knead until dough is smooth and shiny, not sticky. Add water or flour as needed. Let rest at room temperature for at least 30minutes and as long as overnight. Roll out dough to desired thickness (I go around 1/8 inch) and cut into crackers. Bake for 20-25m at 300 degrees until golden brown and crisp. Leave on cookie sheet to cool- crackers will continue to crisp up there. If you want toppings on your crackers, you can egg-wash them before baking and top with sesame seeds, whole spent grain or other seeds. For toppings like salt, pepper, cinnamon sugar, spray the crackers with a quick shot of oil (Pam will work) right out of the oven and sprinkle. We served ours with some Mild Cheddar and enjoyed opening Christmas gifts with the family! Mmm, cinnamon and sugar on your crackers? Sounds delicious.